In 2012 pivotal(arts) theatre company mounted the 25th anniversary production of The Anger in Ernest and Ernestine by Robert Morgan, Martha Ross and Leah Cherniak. The production was directed by Robert Morgan, co-author and the original Ernest, designed by Glenn Davidson the original designer with the original music by George Axon. Daniel Stolfi and Jennifer De Lucia played the title roles. The 2012 production was deliriously funny. Soulpepper’s current production is not. For Soulpepper, co-author and original director Leah Cherniak is the director. Gregory Prest and Raquel Duffy play the title roles. What has gone wrong? 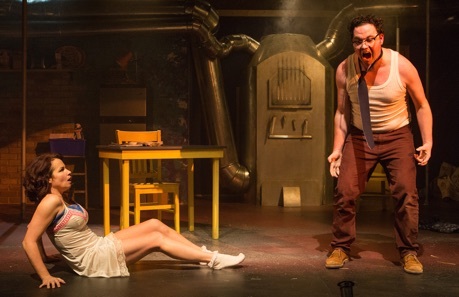 First, Ernest and Ernestine is a physical not a verbal comedy. It is a series of related comic sketches about marriage featuring two who exaggerate their love for one another before they marry and move into their dingy basement apartment, only to find that their habits are incompatible. Ernest is obsessive compulsive; Ernestine is happy making and living in a mess. The plotless action was developed through improvisation and requires actors expert at improvisation and clown to carry it off. Gregory Prest and Raquel Duffy are expert at verbal comedy as they have shown many times in the past, but they are not at improvisation and clown. They both try very hard to be funny but this is the problem. We should never notice the effort in acting and here it is far too evident that both actors are trying to compensate for their miscasting. It is not their fault but Soulpepper’s. After all, why programme a play requiring clown and improvisation if you do not have the right actors for the piece? 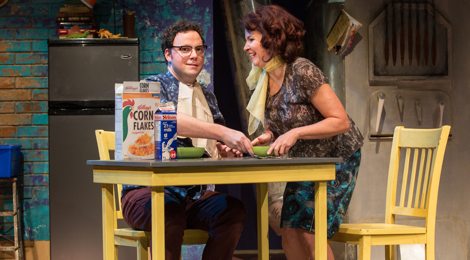 One of the highlights of the 2012 production was Daniel Stolfi’s Ernest dancing to 1980s pop when Ernestine is away from home. Stolfi is also a dancer and the scene was so funny because of the contrast between Ernest’s nerdish exterior and his fantastic hidden talent. In Soulpepper’s production, Cherniak has Prest dance to 1980s metal but there is no contrast. Prest’s nerdish dancing confirms our first impression of Ernest as a nerd. In this way the sketches in Soulpepper’s Ernest and Ernestine move dully from one non-revelation to another. Midway through the play, Ernest and Ernestine return from a traffic accident and write a letter to city hall to protest the lack of adequate signage. In the 2012 production the abuse that the two heap on the government was clearly a method for them to channel their pent-up anger at each other against a third party. In the Soulpepper production, there is no subtext to the scene. Later, when the barely repressed anger in the couple finally explodes and the two ransack their apartment, Prest and Duffy give the impression of going through a mental list of things to destroy one by one rather than making the rampage appear chaotic expression of their characters’ frustrations. Repeatedly, the deliberateness of Prest and Duffy’s goofy actions undermines the the spontaneity that would make them funny. Under Cherniak’s direction Prest is strangely unable to make Ernest as awkward and childish as he should be. It is as if Prest keeps searching for some deeper motivation in a character where there is none. In contrast, Duffy is naturally a much more physical actor and consequently has more success with her role. Even then she can’t get rid of the last shred of calculation, as in her foot-stomping to get her shoes on the morning, that would make the act seems naturally eccentric rather than just a ploy to get laughs. The best scene in the new production is when the couple are suffering from the heat caused by the huge furnace that dominates their living and dining area. Heat caused by a high room temperature gradually turns to sexual heat and the two start tearing off each other’s clothes and seek shelter from the audience. If Prest and Duffy could imbue the entire action with the sense of spontaneity they create here, the play’s comedy might take off. Nevertheless, a large part of the failure of the Soulpepper production, strange to say, is Cherniak’s direction. One would think the co-writer and original actor would know how best to put over her own play, but in the event Morgan’s direction in 2012 was far more effective and insightful. A point Morgan made all through his production was that the two characters are on stage in front of an audience and are aware of this fact. Much of the humour derived from the moments when they would forget themselves and suddenly recall they were being watched. Morgan thus made the audience function as a kind of social conscience that kept the couple from expressing the anger growing inside them. Cherniak emphasizes this fundamental aspect of the play only haphazardly. In fact, in Morgan’s version the couple consistently referred to their apartment as their “theatre home”, whereas with Cherniak this phrase strangely never appears, and with it the entire metatheatrical nature of the play that makes it more than just a series of skits on a familiar theme. Morgan had the couple deliver their separate monologues at a microphone in front of the red curtain that conceals their apartment and then open the curtain themselves. At the close of each sketch Ernest would close the curtain. Cherniak has each actor speak from either side of the stage and the curtain opens on its own while blackouts separate the sketches. Morgan’s approach gave the play the feel of improv sketches at a cabaret while Cherniak’s approach tries to give the play the feel of a literary comedy. Since Morgan’s approach was closer to the truth, it unsurprisingly worked much better. Cherniak has a more elaborate set than Morgan did at the tiny Unit 102 Theatre. Ken MacKenzie has given the basement apartment a self-retracting staircase as its entrance. This is not an advantage, however, since entering the set from the front by pulling aside the red curtain would place the emphasis on theatrical nature of the play. More oddly, Cherniak, given this new prop, never uses it to comic effect. As if all this were not bad enough, Cherniak’s sense of timing is off. While she does show the anger of the couple diffusing at the end, she fails to give the sketches any shape or arc or to give them a consistently urgent pacing. The blackouts separating the sketches, often accompanied by music, are too long and destroy what little momentum each sketch builds up. It is always surprising how different the same play can be in the hands of two different directors. In Morgan’s hands it seemed obvious why Ernest and Ernestine is considered a “classic” Canadian comedy. In Cherniak’s hands the work seems slight and pointless. Without an emphasis on clown and theatre-as-theatre, its notion that marriage is different from falling in love seems trite. Cherniak misses the point, so essential in farce, that the humour of the piece lies in how it is played and paced not in what the characters say. The Anger in Ernest and Ernestine has been staged virtually every year since it premiered in 1987 so there is no particular urgency in seeing it at Soulpepper. Next year will be its 30th anniversary and will likely see more productions. While future productions may never reach the near-perfection that Morgan achieved in 2012, the play would not still be so popular today if it were routinely as unimpressive and out-of-tune as Soulpepper’s production is now. Photos: (from top) Gregory Prest as Ernest and Raquel Duffy as Ernestine; Raquel Duffy and Gregory Prest. ©2016 Cylla von Tiedemann.